Most trusted telecom brand BSNL has announced the launch of new Broadband plans in Jalandhar of Punjab telecom circle as promotional basis for a period of 90 days. State run Telecom Company Bharat Sanchar Nigam Limited (BSNL) introduced Broadband plans exclusive for Jalandhar district of Punjab Telecom circle offering higher download speed and increased FUP limit. 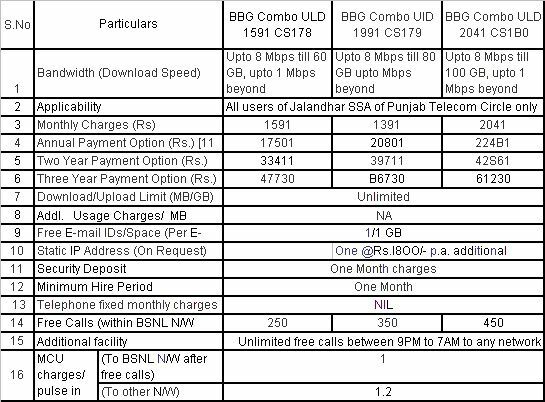 As per latest information, BSNL competent authority of Punjab Telecom circle launched three Unlimited Broadband plans, BBG Combo ULD 1591 broadband plan offering 8Mbps speed before FUP (Fair Usage Policy) limit of 60GB with FMC (Fixed Monthly Charges) of Rs.1591. As well, Combo ULD 1991 broadband plan offering 8Mbps speed before FUP limit of 80GB for monthly rental of Rs.1991. Similarly, Combo ULD 2041 broadband plan offering 8Mbps speed before FUP limit of 100GB for monthly rental of Rs.2041. Whereas, the post FUP (Fair Usage Policy) speed for all the above three unlimited broadband combo plans are limited to 1Mbps. 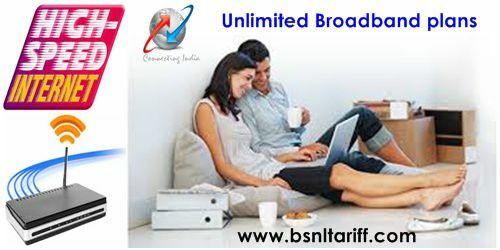 Customers subscribing to any of three broadband plan BSNL provides Unlimited free calls between 09:00pm to 07:00am to any network in India. BSNL provides annual payment option by making advance payment for one, two and three years to customers. BSNL is moving strategically introducing more offers under GSM mobile, Broadband and Landline services in selected districts and telecom circles to counter competition form local broadband players in the region. The above Unlimited broadband plans will be implemented with effect from 12th August, 2016 onwards and available for Jalandhar of Punjab Telecom circle customers.